A thread running through the festival weekend was the artistic and philosophical challenges facing composers and listeners when images and sound cohabit a performance. A panel at a Composer Colloquium had discussed this earlier in the day and it was a recurring theme in those quick and energised exchanges you have right after a concert, whispered between pieces, walking to the next venue or waiting for your coffee or wine. Tonight, I had no idea what would unfold, had never heard Finland’s Defunensemble before and knew none of the composers or works. In contrast to many other performances over the weekend, this All Finnish concert made no use of projected images. But, like the single letters, words and sentences of a novel that unfurl and re-form to become lives and your own experiences, the performance was one of the most rich and visually potent I’ve attended. This was international exploratory music, and tonight Defunensemble nailed it. Juhani Nuorvala’s Ruoikkohuhuilu (2014) begins with Hanna Kinnunen (alto flute) appearing in aquamarine colours out of a dark and gentle crest of pre-recorded sound designed by Anders Pohjola and Timo Kurkikangas (electronics). The flute outlines the open building blocks of chords as if glimpsed through cloud, before descending as a sallow Nordic counterpart. The crescents become glassy and shafts of whole tones are harvested, before drifting away again into the light. It stings a little as you get close, but like the tide Kinnunen returns from whence she came. This was a breathtaking and gentle prologue that kept itself just far enough away from becoming ambience. 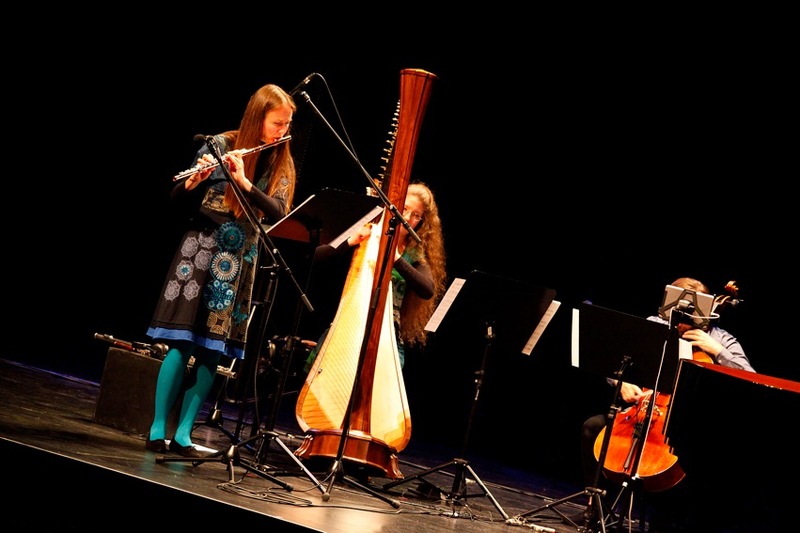 In Ville Raasakka’s Erinnerung (2010), the harp (Lily-Marlene Puusepp), clarinet/bass clarinet (Mikko Raasakka), cello (Markus Hohti) and piano (Emil Holmström) join the flute and electro-acousticians. The players wore headphones for audio synchronisation which allowed them to take part in an extravagant internalised reminiscence. An entire lifetime is recalled in a quick succession of darting textures and contradictions. Beginning with a cubist burst of repeated tones, relationships begin to form only to disintegrate. Harp sides with reinforced piano, but then piano switches to join flute, so harp teams up with cello, while the breath of the bass clarinet intermingles with high piano and cello grinds to a stop. More solid structures build now, but these teeter and need recalibrating. Characters become more mature and the conversation less pushy; three is no longer a crowd. But the tensions of earlier times are not forgotten altogether with the clarinet’s air and cello’s scratch silenced by close-voiced piano repetitions. Hang on, was that an entire life or just one weekend? The relativity and ambiguity of time are further explored in Perttu Haapanen’s Doll Garden (2013) for the same instrumentalists as in the previous work. The acoustic musicians at first represent the thoughts and gaps between the spelling out of the track, which is triggered via the flautist’s foot pedal. The individual keystrokes of a typewriter start off well, but hesitations and corrections increase as the paper gets wound backwards and ackspacebackspacebar and spa ace bar, leeeetterskeyyyyyyyyystart arts___ _xxxxxx xxxrepeating. With paper tearing loose and the platen cogs giving way, we enter a slow dance as the bell at each carriage end carries us round the room. When we open our eyes again, life’s become a high-speed connection and it’s oftentimes turbulent and too fast for our thoughts to keep up. We try to recall and recapture a time when sounds lived on vinyl and the words of a book carried a particular smell. But despite using a QWERTY keyboard to talk to a computer, it’s not the same machine. The bass clarinet and flute hang in the air and I’m wondering what the pact is between artificial intelligence and vintage technology. For Niilo Tarnanen’s Kään (2014) the group pares back to harp, bass clarinet and piano, though with a new microphone position to pick up subtle piano transmissions. The ambient track begins with static prior to both harp and the low register of the inside of the piano producing pings of sound along the copper wire wrappings of the low strings. I’m deep inside circuits and I feel currents flowing hither and thither; the bass clarinet emits a few sinewy charges and there is a strange order to the random spreadings and impulses. Being so close to the components makes it hard to navigate, but I feel we are approaching a nerve centre of sorts. The switches and plucks and battery stings to the tongue are synapses to other worlds. Towards the end we sense a twisting of some giant undersea cable and catch a fleeting glimpse of the meniscus above. The full ensemble returns for the final work in the program—Feed (2013) by Sami Klemola, who joins the group on guitar. He checks his signal through a massive Marshall amplifier; this cheeky response lets the audience know straightaway that we are in for a feast. Of everything I heard over the weekend, this piece was one of the few that showed how freedom and spontaneity can lend a work a burst of creative expression. An organised structure and well controlled timings allowed the players a permissiveness that sent shivers through the audience. The guitarist as ringleader teases and incites the others to join him. The rapid and chaotic improvisation of the opening gives way to a shock unison that morphs into a cluster and snaps off again. Squelching downbeats from the band accompany an extraordinary trade-off between guitar amp buzz and flute air. After five shots, the anarchistic figures begin again but even thicker and darker than before. After this subsides we arrive at the highlight of the work. On cue, the players launch into rhythmic unison three-note figures over and over with pauses between each set. To my ear these are not fixed notes but “any pitches”. In the gaps, guitar fills are the pin pricks of sound produced behind the pickup. As the three-note figures continue—together but always shifting in frequency and pitch—they turn into background to the guitar which now evolves into a full blown exploration of phased hisses, buzzes and scratchings. As the final “free” section of Feed restarts, I ‘see’ it through a different lens. Like traffic from afar it seems an impenetrable wall of noise, but up close it is hundreds and thousands of tiny and equally valid movements and transactions. Even when sirens wail, each goes about its own business, all but trying to hold onto a delicate and fleeting farewell. So drew the 2015 Bendigo International Festival of Exploratory Music to a close. Defunensemble’s All Finnish was a textbook example of what makes a spellbinding concert. This team gave us discernible structural signposts, pieces with cogent emotional intent, huge spectrums of sonic variation, lively and committed playing and a flawless sound design.